What's the best way to hang the prints? 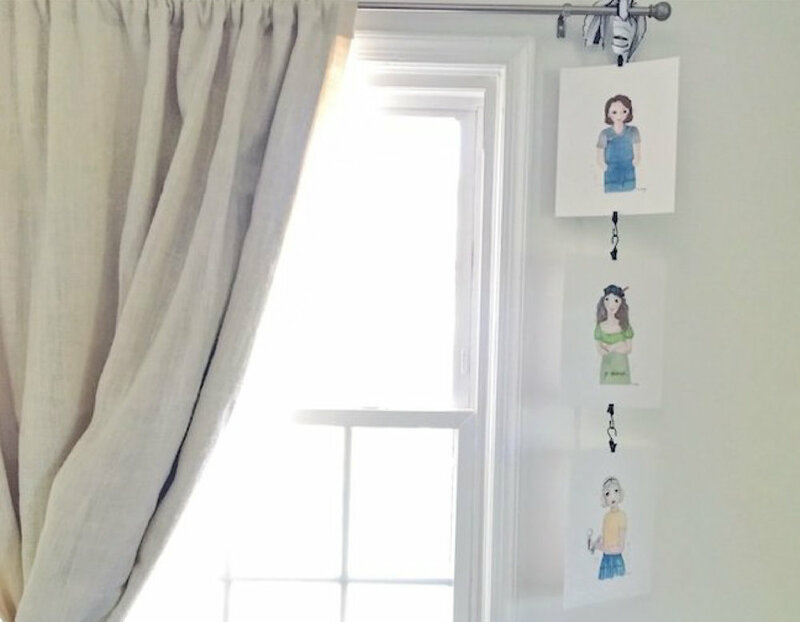 I recommend framing for a consistent look and reliable display, but using clips like these or stringing the prints with clothespins would work, too. What size frame should I use for the prints? The prints are 8.5 by 11 inches, so they fit in a standard 8.5 by 11 inch frame or a 11 by 14 inch frame with a mat. The smaller frames take up less wall space, so if you're displaying a full set, that would be my suggested route. What's the best way to hang the string and clothespins? The most secure way to attach the twine to the wall is with tiny nails. If you tie little loops at the end of the twine, you can hang those on a couple of nails, clip the prints to the twine, and be all set. When you hammer in your nails (or however you attach your string), be sure to pull the string a bit taut. The prints will weigh it down, giving it the semicircle look, and if you start with your string in that shape, it'll fall to the floor. The most secure way of clipping the prints to the twine is to place the print on top of the string and then secure it with the clothespin. How do I use metal clips? The metal clips are best for hanging prints vertically. Choose the order of your prints - we'll go with three as an example - and place a clip on the top and bottom of the first two prints and another on the top of the third. Then you link the hooks together and hang them from a nail, tack, ribbon, etc. Something is wrong with my order; how do I get it fixed? I'm so sorry if your order didn't meet your expectations! Please fill out the form below, and I'll contact you right away. Thank you! I'll be in touch soon to resolve your order!